There’s absolutely no doubt that toasted coconut can transform your recipes. The toasting process just turns those little white flakes into brown crispy flakes with a caramelized nutty flavor. This just adds another level of taste to many of your dishes. Sprinkle over the top of cakes or your morning granola, add it to desserts or salads. Have you ever made toasted coconut macaroons? Learning how to toast coconut is very easy. About the only thing you need to remember is to watch it closely. There’s also no need to make large batches in advance for storage. 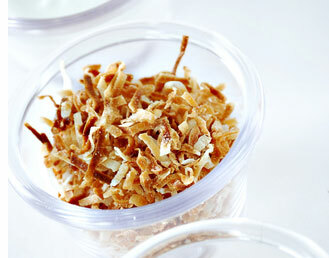 Toasted coconut is so easy to make and takes so little time just make it fresh whenever you need to. Plus you won't have to worry about it losing its freshness or crispiness. 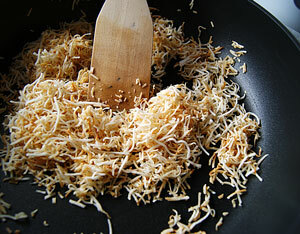 Shredded coconut, coconut flakes and desiccated coconut can all be toasted. 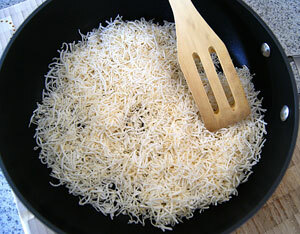 There are several different methods for toasting coconut: in the oven or on the stove top. This method is suitable for small amounts of about 1 – 2 cups. Place the desired amount of coconut in a large skillet or frypan. Choose one with a heavy base. It will heat more slowly with a more even heat, ensuring the coconut doesn’t cook too quickly and burn. Spread the coconut evenly over the pan and cook over a medium heat, stirring constantly until it begins to turn brown. Turn the heat down immediately. Coconut, once hot, burns quickly and sweetened coconut will brown much faster than other varieties. Continue cooking until most of the coconut is a nice golden brown with only a few white strands. The whole process should take less than 5 minutes. Once browned, remove the coconut immediately and place in a bowl, as it will continue to cook. The advantage of this method is that the coconut browns a little more evenly. Preheat oven to 160°C / 325°F. Line a baking sheet with baking paper, this makes it much easier to remove afterwards. Spread the coconut over the baking sheet in a thin layer. Bake in the oven for about 10 - 15 minutes. You will need to watch it very carefully, as coconut doesn’t take long to brown. After 5 minutes give the baking sheet a shake so that the coconut flakes don’t burn. Repeat this process again. This helps to ensure even browning. Remove from the oven immediately when browned, and transfer to a bowl. Once your coconut is browned remove from the heat immediately and transfer to a plate. The heat from the pan will continue cooking and browning the coconut. If your recipe calls for sweetened coconut, and you only have unsweetened, you can easily make your own. Simple place a pound of coconut into a ziploc bag and add 2 tablespoons of confectioners sugar. Give the bag a good shake to distribute the sugar evenly. You now have sweetened coconut.